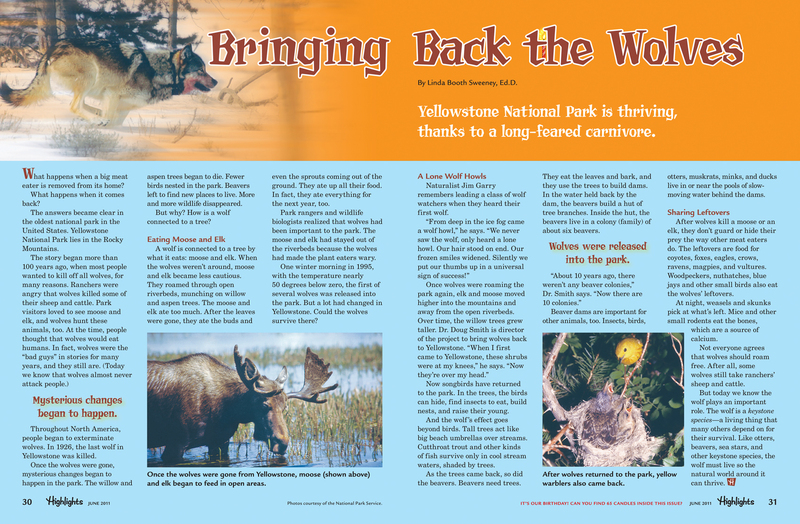 Center for Ecoliteracy: If you cut a cow in half, do you get two cows?(Interview. talking with kids about living systems). Connected Wisdom: (Good old stories about living systems, along with fun activities in the teachers guide, free training module and more. Just follow the yellow flower icon.) I’m happy to report that we have two NEW Connected Wisdom resources: A teachers’ guide and an on-line, video-based, training module (both are free). If you love all things related to LIVING SYSTEMS and STORIES, read the lost endnotes (cut by the publisher!) to Connected Wisdom. 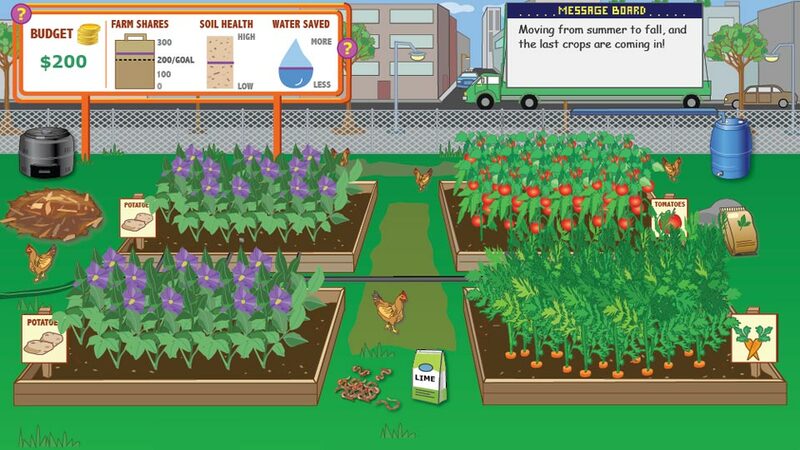 Systems Thinking Playkits: (Interactive game for kids, 8-88! Wolf kit too). 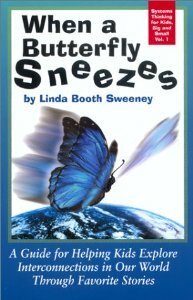 And the one that started it all: When a Butterfly Sneezes: A Guide for Exploring Interconnections in Our World Through Favorite Children’s Stories. (Using pictures books , many of which are likely on your bookshelf, to encourage children to “connect the dots” and other systems thinking habits of mind): You can order this book through Leveraged Networks (Contact Rebecca Niles – rebecca@leveragenetworks.com, or Kris Wile kris@leveragenetworks.com). 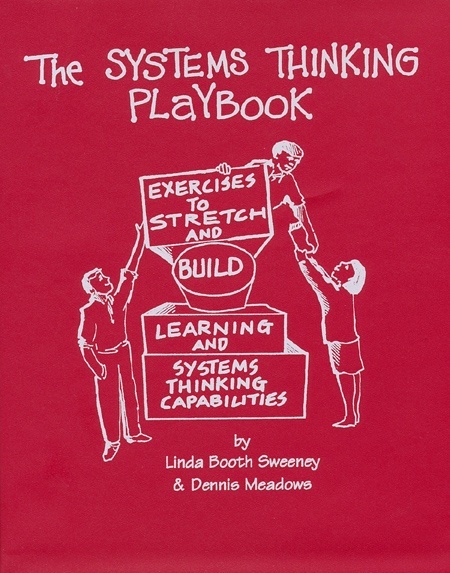 Although The Systems Thinking Playbook/DVD (30 experiential activities to build systems thinking habits of mind) wasn’t originally written for children, I frequently receive notes from educators who use it in their classrooms, so I’ll add it here. 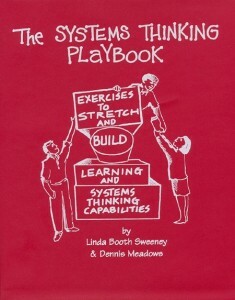 (The Creative Learning Exchange has made connections between the Playbook and their Connection to Characteristics of Complex Systems Project. See www.clexchange.org to learn more). And some good news: The System Thinking Playbook is now available as an e-book (and available on Apple, B&N and VOOK as well). Museums + Systems Thinking: I worked this year with the Mishkat Interactive Center for Atomic and Renewable Energy and the amazing team at KCA London to integrate systems thinking into the Saudi Arabia 2050 traveling exhibit designed to encourage middle school students in Saudi Arabia to rethink energy consumption habits. A fantastic project! I’ll post pictures when I can. Digital Media: As part of a collaborative initiative with the University of Indiana, the National Writing Project, the Institute of Play, and Digital Youth Network, I worked with the MacArthur Foundation’s Digital Media Learning Initiative to produce a series of digital design activities to cultivate systems thinking in middle school students. 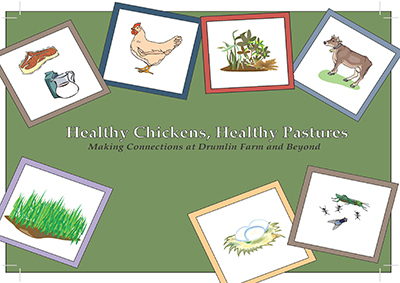 The books are done and will be available in early 2014. I’ll post a link when I get it.